Alasdair MacIntyre explores some central philosophical, political and moral claims of modernity and argues that a proper understanding of human goods requires a rejection of these claims. In a wide-ranging discussion, he considers how normative and evaluative judgments are to be understood, how desire and practical reasoning are to be characterized, what it is to have adequate self-knowledge, and what part narrative plays in our understanding of human lives. He asks, further, what it would be to understand the modern condition from a neo-Aristotelian or Thomistic perspective, and argues that Thomistic Aristotelianism, informed by Marx's insights, provides us with resources for constructing a contemporary politics and ethics which both enable and require us to act against modernity from within modernity. 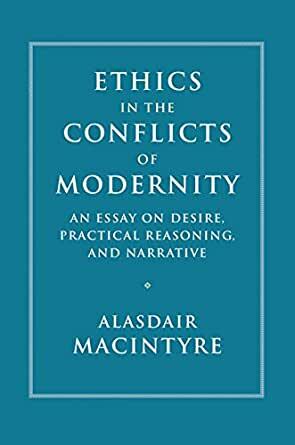 This rich and important book builds on and advances MacIntyre's thinking in ethics and moral philosophy, and will be of great interest to readers in both fields. Alasdair MacIntyre wrote this book for the well-educated layman. Relying on Aristotelian precepts, he simplifies many of the criticisms of modern ethics set forth in his earlier works (e.g. After Virtue: A Study in Moral Theory, Second Edition), noting the various weaknesses of modern ethics, or what he calls "Morality." As an alternative, he focuses on the need for practical reasoning and the development of moral agency in pursuing common goods, the goods of work, community, and family. These goods are achieved in and through a variety of social relationships over the course of a life. Using four biographies, he illustrates the tensions and problems associated with finding one's way through life in more or less successful narratives, each with its own merits and imperfections. The people described are more or less reflective in their decision making when confronted with the realities about themselves or their situations at different points in their lives. There is an emphasis on the social context of those lives, the goods available to them, along with the people, culture, and institutions with which they interact. All of these factors inform their decision making, which include trade-offs at various points in their lives. For better or worse, those interactions and relationships inform their preferences and how they rank those preferences, in ways that are intimately tied to their roles and identities. This book is refreshing in many ways, citing examples as diverse as W. Edwards Deming, Quentin Tarantino, Cummins (the diesel engine company), and Sandra Day O'Connor among others. It describes the problems of practical reasoning, but does not prescribe general resolutions to those issues. Instead, it outlines the kinds of considerations, both individual and collective, that should be part of a well-lived life. 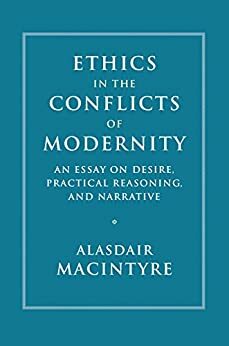 Many of MacIntyre's earlier critiques of modernity can be spotted in this work, but the main consideration is outlining the preservation of rational moral agency in a culture dominated, and sometimes corroded, by grand theories of modern Morality. 5.0 out of 5 starsMacIntyre's masterpiece! This is without a doubt MacIntyre's masterpiece, bringing together and synthesizing the themes developed in After Virtue, Whose Justice? Which Rationality?, and Dependent Rational Animals. The book combines a trenchant critique of modern secular ethics, as taught in today's Philosophy departments, with a carefully argued articulation of MacIntyre's own "neo-Aristotelian" outlook, informed by insights from Marx as well as from modern psychology. One caution, however: While MacIntyre claims in the Preface to have written the book for the lay reader, his subtle and nuanced reasoning in fact makes for demanding reading even for a professional such as this reader. 3.0 out of 5 starsNeeds an Editor. It may be cheeky of me to give an average review to Alisdair MacIntyre. At his worst, he is an important philosopher. His work here expands and elucidates his descriptions of emotivist philosophy. The contrast with both Aristotle and Aquinas is developed further. In other words, MacIntyre has reached the point where he is expounding rather than developing his framework. The result is a useful application of his main thesis, which is the modernistic abandonment of tradition, deep philosophy, and the systematic community of learners. But this is poorly written. His writing has become ponderous. He over-explains, and he lacks verve, or punch. He is in need of an editor. Is this shallow? Yes. I accept that this is a shallow review. But this is a short book, and for a short book to read like it was written in molasses, is sad, especially when earlier works crackle and are sharp. I'm SO TIREd of Cambridge's poor printing quality. Type is grey, fuzzy-edged, horrible on the eyes. Cambridge used to have such high standards. Many cheap presses produce more elegant, readable pages -- my own laser printer does better than this.